I’ve called out historical inaccuracies in movies before, the most glaring of which comprise almost the entirety of Braveheart. So I’d be remiss to not point out that The Butler is also an inaccurate representation of its real life inspiration. However, where Braveheart manufactured scenes that bear little or no resemblance to historical fact in order to craft its narrative, The Butler borrows from actual historical reality to create its story. One could argue that both are dishonest storytelling, but I disagree. 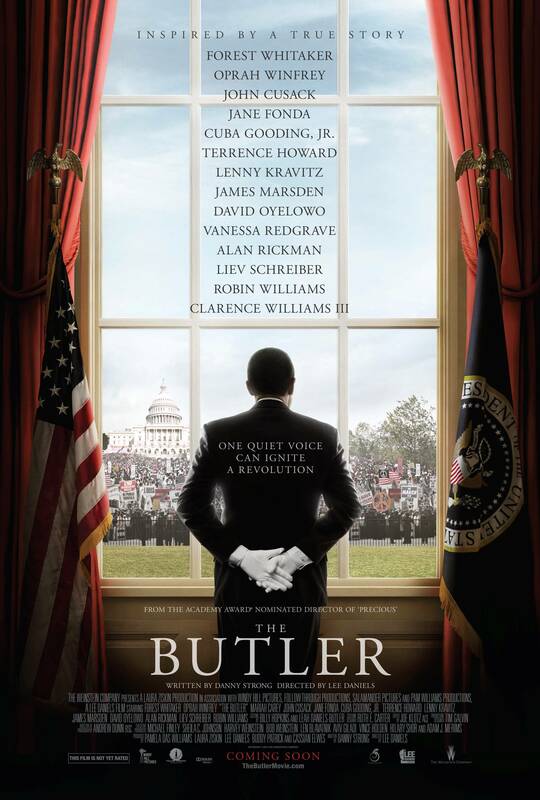 The Butler is at least true to the African American experience, which is important even if it doesn’t get all the facts exactly right. This film tells the story of Cecil Gaines, the son of Georgia sharecroppers who rises through the ranks of the domestic world to become a White House butler. His career ultimately spans over three decades and eight presidents. The story focuses on his family, most notably a son who becomes socially active during the Civil Rights Movement against his parents’ wishes. The tension between father and son is one of the primary narratives in the film, one that never transpired in real life. Still, it was an engaging device to contrast life within the White House with the realities of everyday Americans fighting for things as simple as equality and respect. While the inaccuracies in the movie don’t bother me, the casting does. Forest Whitaker is excellent as the titular butler, as are Lenny Kravitz, Cuba Gooding Jr., and Terrance Howard as his coworkers and friend. Many people probably think Oprah Winfrey was terrible, but honestly she is great. I never once thought of her as Oprah, she so perfectly embodies her role as housewife and mother. The real problems lie in the obvious stunt casting that comprises the presidents and first ladies. I just don’t see the point in casting such recognizable actors for scenes that often last only a couple of minutes. It’s incredibly distracting, despite how well they portrayed their political counterparts. This is a rare movie about real issues that reaches a large audience. Most films like this are released in December so they’re fresh in the mind for the Oscars, and are usually only seen by a small number of movie goers. The Butler was released in July, during the peak summer period. This was unusual for a film that is clearly trying to create Oscar buzz. It has a massive cast of characters, led by an always solid Forest Whitaker as Cecil Gaynes, a butler in the White House who served 8 presidents over his 30 years employment in Washington. The majority of this film revolves around Cecil and his son Louis’s relationship. Cecil had grown up as a slave (well it seemed like he was a slave, although he would have been a child well after the end of the Civil War so I’m not sure if he and his dad was just an employee, it’s not really explained but the impression I got was that he was a slave). When his dad is murdered, Cecil is taught how to be a server by the lady of the house and uses these skills to get all the way to the White House, as a butler for the President. He begins his tenure in the 50s with Dwight Eisenhower and serves all the way to when Reagan was president in the 80s. He was in the room when important decision were made about civil rights by the leaders of America. Cecil’s son Louis (David Oyelowo) has just graduated from an all-black high school and wants to go to college in Tennessee. While there, he gets involved in the Civil Rights Movement. His son’s involvement is troublesome for Cecil as he works for the president and it might look bad if the son of one of his employees is running around with this type of crowd. Most of the film is centred around the Civil Rights Movement and how each president dealt with these issues. I do have some issues with this film. I feel like there is a lot of stunt casting in it. Nearly every president is played by a well-known actor. Robin Williams plays Eisenhower, even though he is only on screen for a few minutes. It is very distracting when these popular actors show up. I think I’d have preferred it if they’d gone for lesser known actors. It would not have been so distracting. My only other issue is that the film tries to cover so much time. The film is 132 minutes long and tries to cram 30 years of history into the movie. It struggles to cover this time period adequately. The bulk of the film is set in the 60s and 70s, I feel like the scenes set in the 80s do not add much value to this film. They seem to be there just to get Alan Rickman and Jane Fonda as Ronald and Nancy Reagan some screen time. I’d have preferred it if maybe the scenes from the 80s were cut and more time was devoted to the crux of the film, which is the Civil Rights Movement of the 60s and 70s. In saying that, this film is very well made. Forest Whitaker is always great as Cecil Gaynes. He is heartfelt and charming when he needs to be, but can also be quite angry and scary when his son and him come to blows over his involvement in the African American group the Black Panthers. Whitaker is ably supported by Oprah Winfrey, she is surprisingly good as his wife Gloria, as is David Oyelowo as Louis. The cast is too huge to mention everyone, but they are all mostly good. This is a film that attempts to cover some of the most historical events in US history. The Civil Rights Movement and JFK’s assassination are just two of the many events covered in this well-made portrait of the White House and its employees. There is some question mark about the historical accuracy of the film. As I mentioned earlier, the film implies that Cecil and his father were slaves, something that was likely untrue due to the time period being covered. This is one of many times that the film makers may have taken liberties with the truth. It’s hard to know what’s accurate and what isn’t, but this doesn’t take anything away from the film though, it is still very entertaining and worth seeing.